Feel the power and productivity of the SG52 zero-turn sprayer/spreader machine. With its dual 30-gal. spray tanks, Spyker 225-lb. 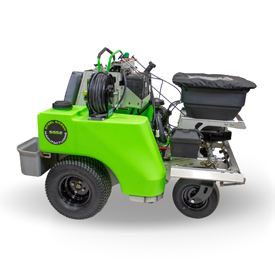 hydraulic-driven granular system, and high-density poly fertilizer trays, the SG52 holds up to 60 gal. of liquid and 325 lbs. of granular product. Steel Green machines come standard with a decked out 21-hp engine and a powerful 20/50 amp charging system to give operators the ability to run a high-volume pump and other attachments. For brakes that hold (even on hills), our wheel motors have integrated drum brakes, and our 22-in. commercial grade turf tires provide additional hillside stability.